We used manual arc welding to hardface a crusher jaw with a hard-facing filler metal of HF-11 of the 13%Mn type. Consequently, the weld detached from the base metal. What caused this to happen, and what welding procedure would have prevented it? 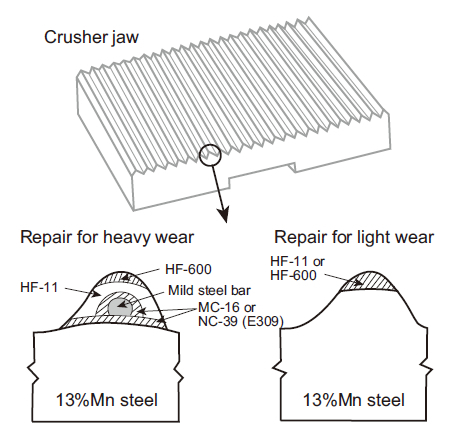 Crusher jaws are typically made of 1.2%C-13%Mn austenitic cast steel. As this steel offers toughness and ductility with high work-hardening capability, it resists wear especially in service accompanied by impact loads. On the other hand when this steel is heated at temperatures above 300°C for prolonged periods, carbides precipitate at the grain boundaries, reducing toughness and ductility and thereby causing cracking. The high workhardenability of this steel ensures that the surface layer is work-hardened after operation. Figure 1 shows how 13%Mn cast steel used in the mantle of a gyratory crusher can become work-hardened after operation. Clearly the layer at 1.5-2 mm from the surface exhibits markedly higher hardness than the interior. 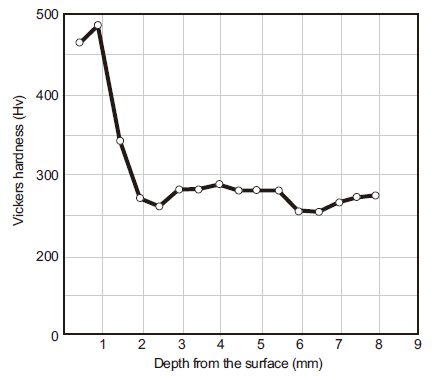 Figure 1: Hardness distribution of the 13%Mn cast steel mantle of a gyratory crusher after operation [Ref. 1]. Crusher jaws can be rebuilt and hardfaced successfully by arc welding; however, on account of the properties of 13%Mn cast steel, close adherence to the following welding procedure is strongly recommended. (1) Grind away the work-hardened layer of the base metal to prevent cracking in the interface between the weld metal and base metal. ・Avoid continuous welding and, if possible, apply water to cool the workpiece. ・Interpass temperature should be 150°C max. ・Keep heat inputs as low as possible by limiting amperage and depositing stringer beads. (3) Select appropriate filler metals depending on the amount of wear to be rebuilt or hardfaced as shown in the figure below. HF-11 is a 13%Mn austenitic hardfacing covered electrode. HF-600 is a martensite-type hardfacing covered electrode with a nominal hardness of Hv:600. MC-16 is a 16%Mn-16%Cr austenite-type covered electrode. (4) Use no postweld heat in order to avoid carbide precipitation and embrittlement. S.Yamamoto. Arc Welding of Specific Steels and Cast Irons, Shinko Welding Service Co., Ltd.